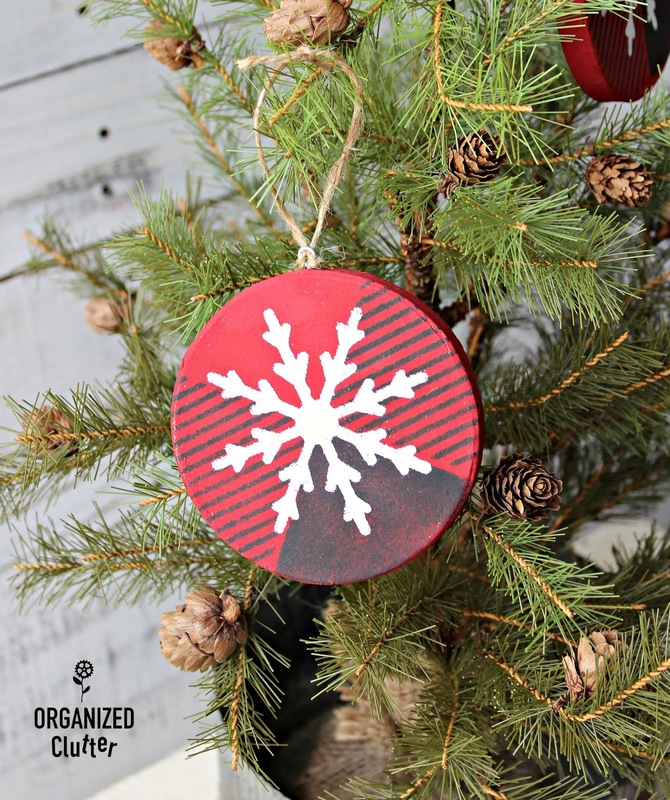 Last year, Donna Williams of Funky Junk Interiors and Old Sign Stencils, cut out wood squares from a 3" x 3' hunk of wood, and made these ornaments with her buffalo check stencil and black and red paints. 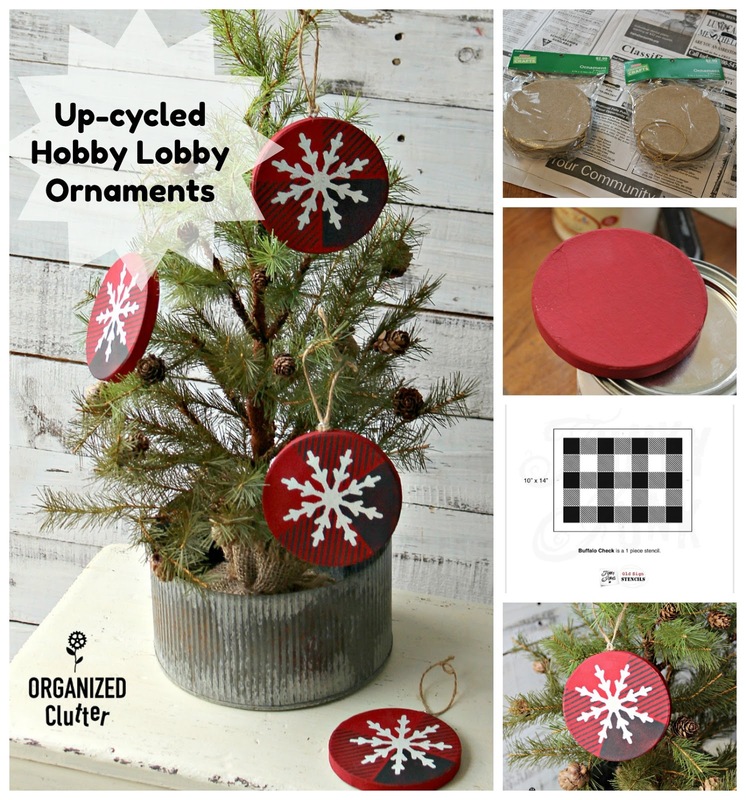 This year, I found these paper round ornaments at Hobby Lobby! Two per package at 50% off of $2.99. If you don't have a 3" x 3" laying around, or YOU CAN'T cut one up, here is an alternate plan. First, I cut the gold strings off of my ornaments. My ornaments are going to be rustic. No shiny gold hangers for me. 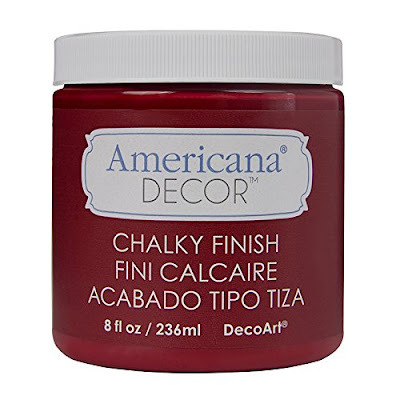 Then, I painted the ornaments with my favorite Christmas red, DecoArt Chalky Finish Paint in Rouge . I just brushed on one coat, and then touched up any areas that needed it. I clean it between projects with KRUD KUTTER Tough Task Remover Spray I spray the stencil in the sink, wait about 10 minutes and then run very hot water over the stencil. The paint starts to loosen up and fall off. 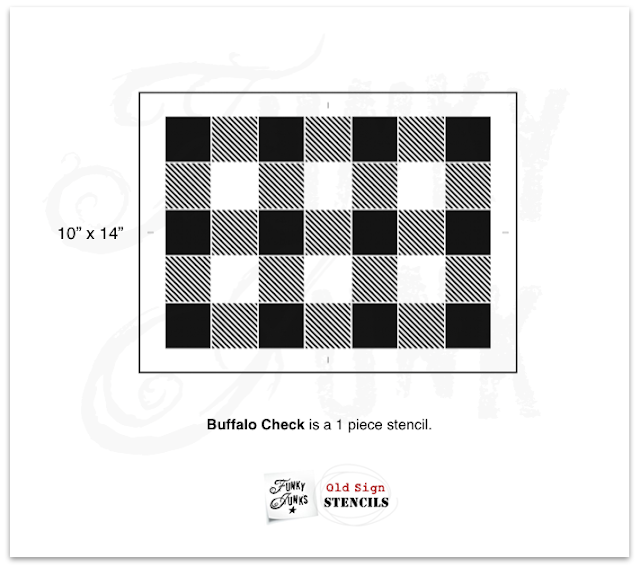 I used Dixie Belle Paint Company Chalk Finish Paint in Caviar to stencil the buffalo checks. This is how my ornaments look after the stenciling. 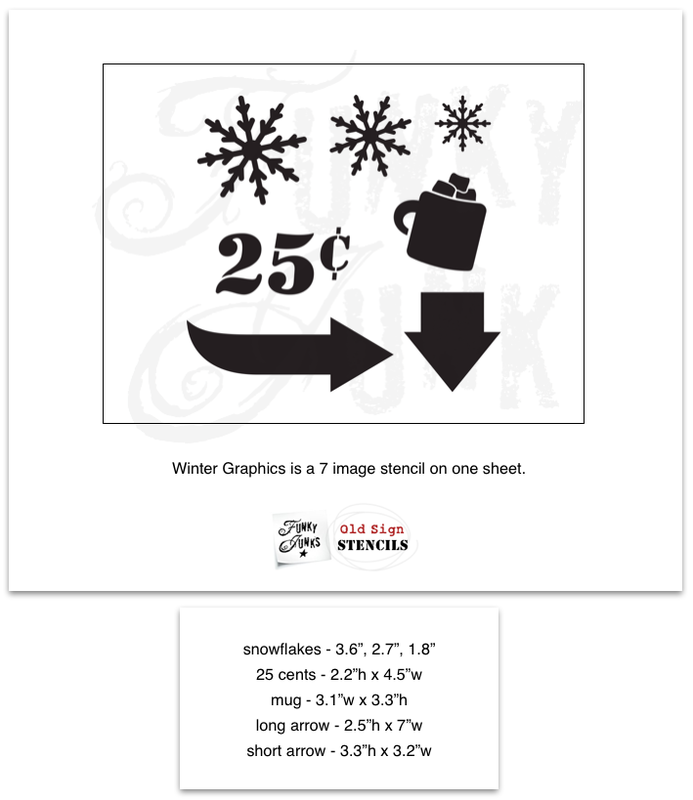 I also used the medium sized snowflake from the *Old Sign Stencils winter graphics stencil. I stenciled the snowflakes with Fusion Mineral Paint in Champlain. I then screwed a Screw Eye 17/32" into the hole from the gold thread hole. The screw eye stays in very well but if you want to reinforce it, add a drop of glue to the hole. Then I tied on a thin jute string for hanging! My four ornaments are all done! I have four new ornaments for $2.99. 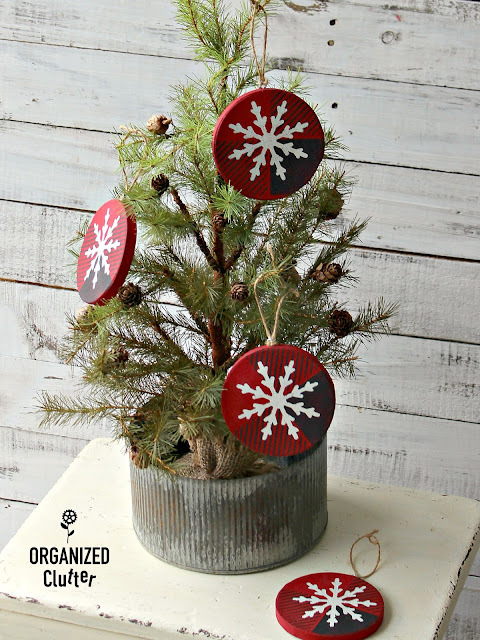 If you don't have the buffalo check stencil, just paint and add a snowflake. Ornaments need not cost a lot! 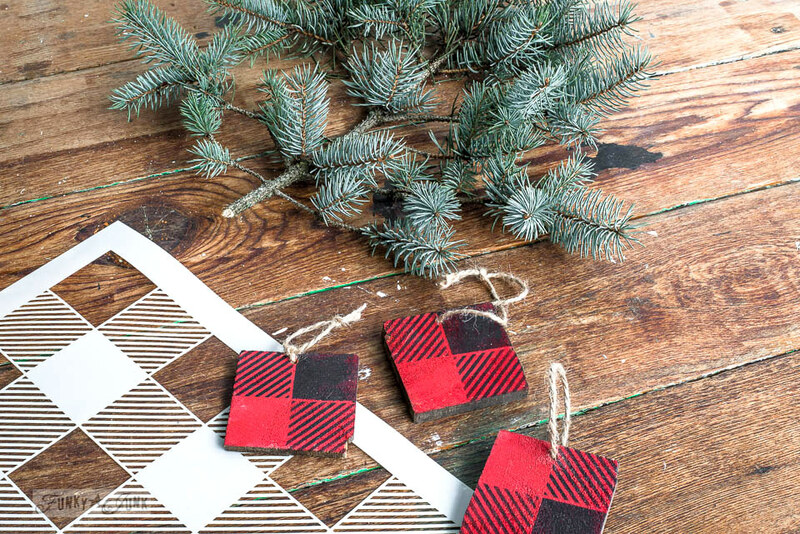 These ornaments are so fun, and totally do-able! Love how the snowflake pops off the buff check! Stunning and professional results!